Even if you’re new to Basel, I’m sure you noticed that the city is divided by a river. This river is the Rhein (English spelling: Rhine). 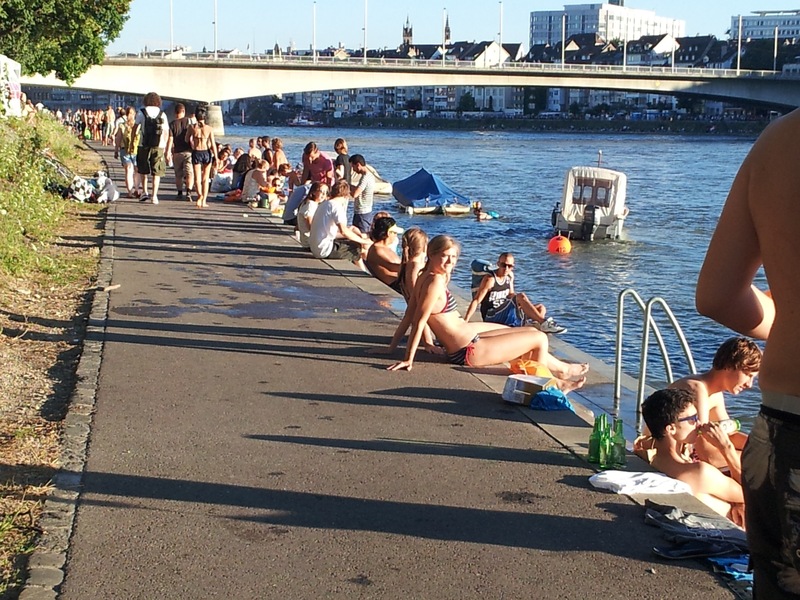 In the summer months, you’ll also notice that lots of people like to swim in the Rhine (including myself). Others refuse to swim in the river, for various reasons. Even for people choosing not to take a dip, there are still lots of places to relax on the banks of the Rhine, and just enjoy the view. I want to use this post to give you some information about the Rhine, make you aware of the dangers of Rhine swimming, and give you some tips, if you do decide to take the plunge. As with anything else in the world, know your limitations and be aware of what you’re getting yourself into before going for your first Rhine swim. 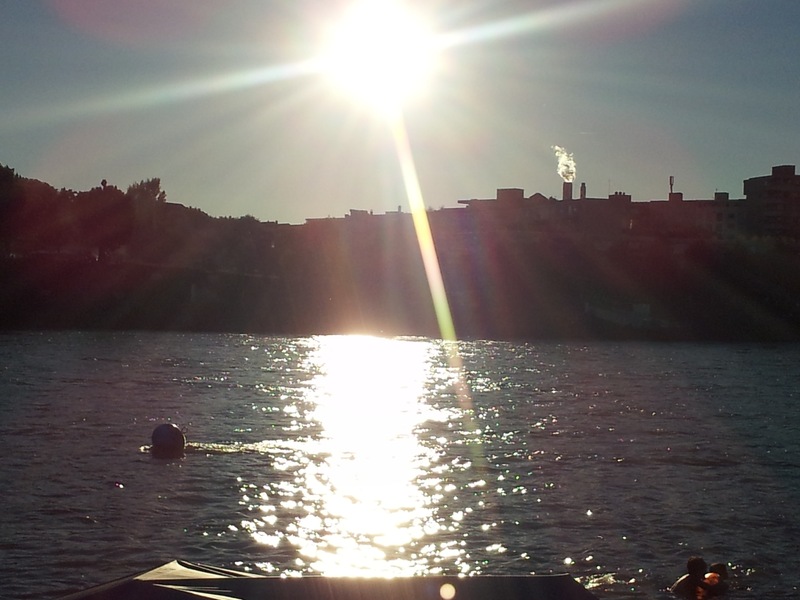 There is little I enjoy more than heading off on a sunny, summer day for a bbq by the Rhine. There are always lots of people of all nationalities, young and old, enjoying the summer by grilling, having a few cold drinks, and soaking up the sun. The atmosphere is generally very good, peaceful and relaxed. Most of the people coming to the river are tolerant if not friendly, and work on the ‘treat others as you’d have them treat you’ principle. Maintain a moderate level of respect for your neighbors. Don’t play your music too loud, don’t be obnoxiously drunk, clean up after yourself/children/pets and try not to drench any strangers if you jump in the water. The same way you’d hope them to be. I’m not going to lie to you, up until the 1990’s the Rhine river was a nightmare. It was used as the dumping ground for various industries, and was incredibly polluted with toxic, industrial chemicals. Since then, billions of Euros have been spent trying to clean up the Rhine. Fish populations are starting to recover, and the river is coming back to life. There are still higher levels of bacteria than you’d probably like (so don’t drink the water), and even though the river is much cleaner than it used to be, it’s still not as pristine as it could be. Also, a lot of people urinate in the river while swimming. One more reason not to open your mouth in the Rhine! Think before you decide to swim in the Rhine. If you are not a strong swimmer, don’t go! Its a river with a strong current, and there are no lifeguards to help you out of you start to struggle. The current changes drastically, depending on the water level and the time of year. Even if you are a good swimmer, be sure you go with some other people so if something unexpected happens (leg cramp, etc.) they can give you a hand. Don’t swim if you’re intoxicated, too tired, dehydrated, or have any other injuries or conditions that might affect your swim. It is not enough to be able to just float downstream, you really have to be a strong and confident swimmer. Don’t jump or dive into the water. In addition to the irritating splash you’ll make, you may hit the bottom, depending on the level of the water, cutting your feet on rocks or glass. Certainly don’t dive in head first! Jumping off the bridges or hydroelectric damn will also get you hurt, killed or in trouble. I know one girl who was confined to a body cast for months, after foolishly jumping from one of the bridges. The water can be cold. Really cold. Be sure to check the water temperature before start swimming. If you start feeling too cold, get to the side and get out of the water!! Stay close to the banks for the river when swimming and keep your eyes open for both big and small boats. When passing under the bridges keep away from the supports/pillars. There are strong eddies and currents that can be unpredictable. Don’t swim at dusk or after dark. Know where you’re getting in and getting out of the river. Take a long walk or two along side the river, right to the end and know where you plan to get in and out. A great place to get into the water is just behind the Tinguely Museum. You can wade in, check the water temperature, assess the current and decide if you want to abort the swim. If you miss the place you planned to exit, don’t panic; swim to the nearest bank. Don’t wait till the last exit point to leave the river. If you miss the last exit, you are screwed! There are lots of ladders and ramps to get out of the Rhine. Sometimes the ramps get very, slippery with algae, so be careful. I prefer the ladders. There are waterproof bags that you can buy in various shops online, in the city or along the Rhine. They are great for putting your clothes, wallet, watch, phone, etc. to keep them safe when you swim. They do leak from time to time so for your electronics and valuables, I’d suggest you bring along an extra ziplock bag to put these items in, in case you do spring a leak. Most of the waterproof bags are dual purpose; they double as a flotation device if you put some air in them before you close them. If you’re not a good swimmer, don’t rely on them too much. They’re no substitute for strong swimming skills. The most common water proof bag is the fish bag (Wickelfisch). These clever devices come in assorted sizes and colors, so hopefully you’ll find something to match your taste! The use of inflatable swimming aids such as rubber tire tubes, air mattresses and inflatable rafts/boats is not allowed. There are police boats that drive up and down the Rhine and if they catch you in one of these, they may decide to fine you. If you follow the rules, take the proper precautions, use good judgement and think about what you’re doing, you’ll have a great Rhine swim. Here is an interesting Youtube link, if you want to see what swim in the Rhine is like. Every year there is a annual Rhine swim day, where thousands of people go to the river. You should decide whether it’s fun for you or if its the day you want to stay out of the Rhine. In 2018, this is planned to take place on Tuesday, August 14th, 2018 around 18:00. If the weather is bad it will be re-scheduled. 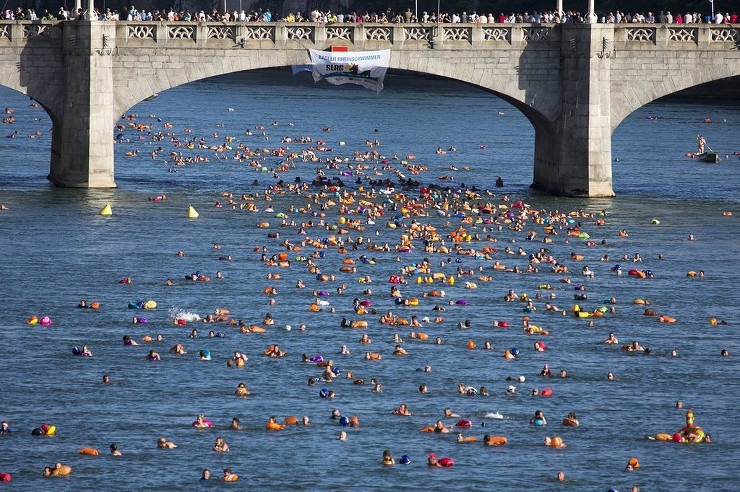 On the official Rhine Swim day, THOUSANDS of people take to the river. Barbecuing / grilling by the Rhine is permitted, but please use common sense. You can buy small grills all over the place in Basel. Most chain grocery stores (Migros and Coop) carry disposable BBQs in the summer months, but they often don’t work very well. You can get small, reusable, portable charcoal grills that work much better for under 50 CHF. We got ours for 20 CHF at Interdiscount (an electronics shop) of all places, and its lasted a few years so far. Think about bringing a cooler to keep meat and drinks cold. Ice is hard to find in Basel and expensive when you do find it. If you have a decent amount of freezer space, fill a couple of ziplock sandwich bags with water and make your own ice a couple of days before. Or if you’re feeling posh, buy some reusable freezer packs with non-toxic blue gel. I hope that this post has made you aware of both the pleasures and dangers of a day at the Rhine. Be careful, have fun and enjoy your life in Basel!! What happens if one misses the last exit. Are there any high waterfalls and if so, what other dangers are there beyond the last exit ? P.S. Is the current stronger than in the Aare river in Berne ? There is a cemetery for people died in the Rhine, near the Passerelle des Trois Pays. It is 3 squared metres large, and expected to be enlarged by 2018.